As you remember it is impossible to suspend a regular magnet in space with the sole help of other regular magnets statically placed around it. Well, the theorem is not applicable in this case because one of the magnets is not statically placed in space, it is spinning. There is a non-magnetic force involved here that makes this possible. If you try to suspend the top over the big magnet without spinning it will try to flip over. Gyroscopic effect and precession prevents this from happening. In fact the full explanation of why this is working is way more complicated, but let’s stop explanation here and start building the device. 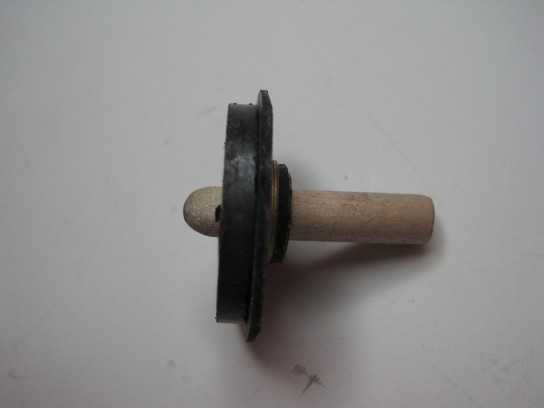 bunch of rubber and brass (i.e. non-magnetic) washers from Home Depot (Lowes has better selection of rubber washers, Home Depot has more brass ones). 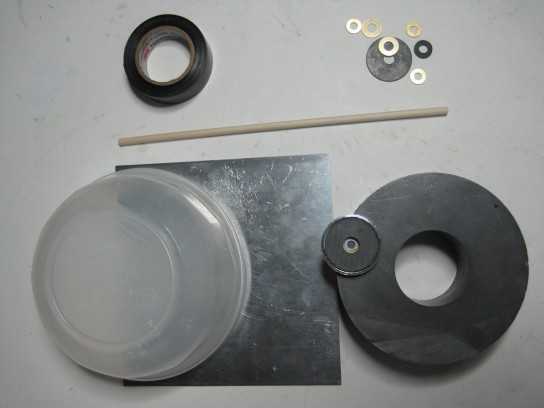 In fact for this exact setup I used only one washer with 32mm in diameter and 1.3mm in thickness. All other brass washers were not necessary in the final version. plastic container from your cupboard to cover the large magnet. 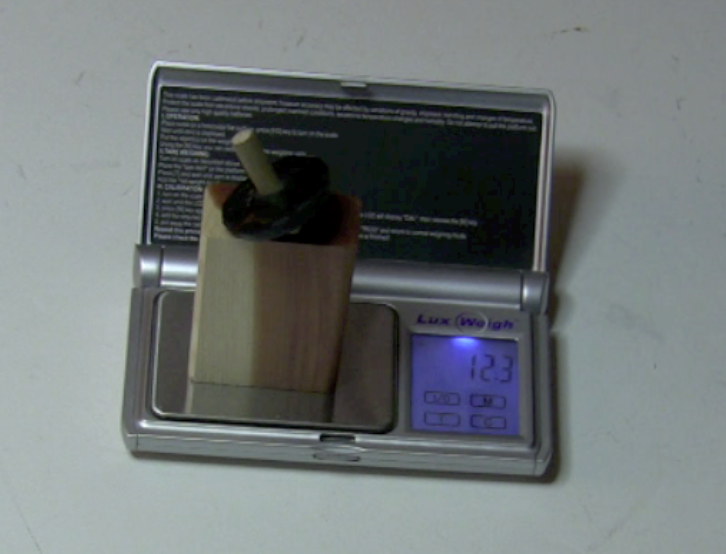 I used a 68mm tall and 143mm in diameter container #12 (1.5pt) from Rubbermaid. All in all this setup cost me approximately $30. You actually do not need to follow these exact specifications, I only provide them here for reference. 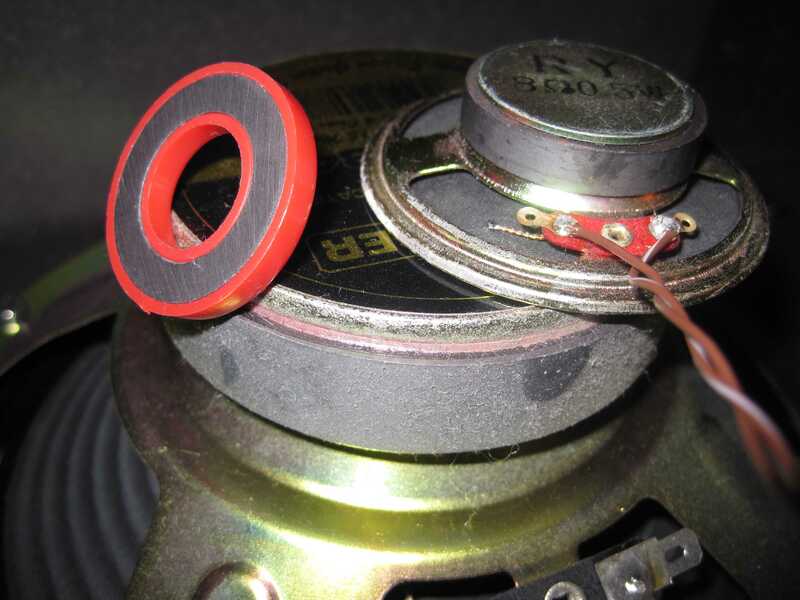 You can pull any large enough ring magnet from a large speaker and find appropriate smaller ring magnet. Unfortunately easily available ring magnets from RadioShack didn’t work for me as they are too weak, but you sure can find something appropriate in a smaller speaker for instance. The plastic container is required to protect the magnets from each other. No matter how careful you are the top will keep falling down and eventually hitting the magnet. Each time this is happening small sharp chips will fall off the magnets. Besides covering your work place with potentially dangerous to electronics magnetic dust they also ruin all your efforts to fine-tune the top. You don’t want that and the best way to prevent it is by covering the large magnet with a plastic container. Another function of the plastic container is to adjust the distance between the top and the large magnet. As you can see in the video this distance is very critical for successful initial spinning. the top of the container (plus the plastic sheet) should be very close to the position where the large magnet stops repelling the top and starts attracting it. 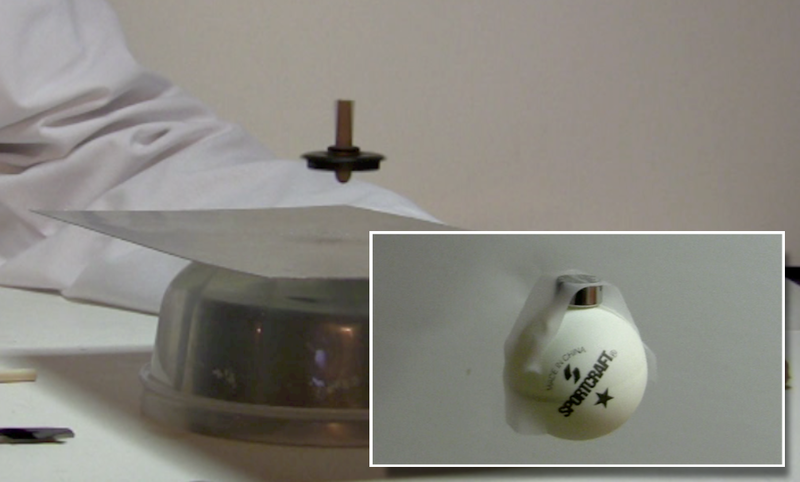 In fact you can even move the small magnet along the top stem to calibrate this distance precisely. If you try to spin the top on top of properly adjusted container it will actually stabilize itself for 5-6 seconds and spin absolutely straight. The smaller magnet I’ve got was inside a steel cup. In order to extract the magnet from the cup I soaked it in hot water for approximately 20 minutes, then used a screwdriver to pry and remove the magnet. Use the dowel to turn the small disk magnet into a top. I cut approximately 32mm off the dowel and polished one end with sanding paper to give it something like parabolic shape and make it smoother. 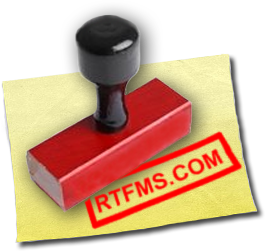 If you’re exactly following the specifications from rtfms.com add the rubber washer to make its weight approximately 12.5 grams. Make sure you put a non-magnetic spacer between the top and the scale, otherwise metal parts of the scale will attract the magnet and the measured weight will be inaccurate. See the video for details. Now stack the large magnets. Do not just put one on top of another -- you will damage both the magnets and your fingers. Instead, slide the top magnet on top of the other one. If that doesn’t work and magnets repel each other then flip one of the magnets and repeat the attempt. Cover the large magnet with the container, put the aluminum sheet on top and your setup is ready. Now is the hard part and it will probably take you an hour or two. We need to fine-tune this system, and unfortunately I don’t have many pictures to describe the process, you need to watch the video for more details. The big magnet is placed upside down. Remove the cover and slowly lower the top on it. If, while lowering the top, you won’t feel anything then it you feel like the top is sitting on a magnetic pillow then it’s the wrong side. Flip the large magnet over. Now the top feels some resistance while you’re lowering it, than the big magnet starts pulling it inside the hole. That’s the right orientation. Put the cover back. The top is too high above the big magnet, so big magnet repels it and once you spin it it will fly away instantly. 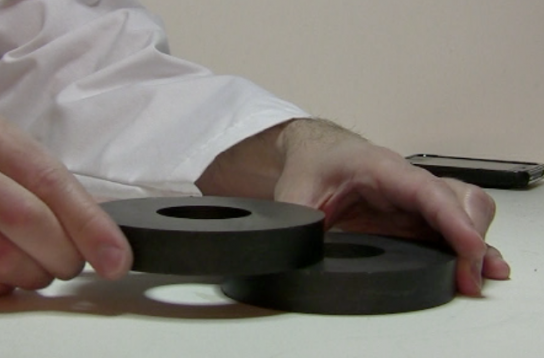 Reduce the distance from the top to the large magnet by lifting the large magnet. Washers and bottle vups will help you to lift the large magnet. The top is too low above the big magnet, so big magnet attracts the top too much and gyroscopic force is not enough to keep it straight. In this case it falls and tumbles immediately after you release it. You need to increase the distance between the top and the magnet. You can do it by lifting the plastic container on washers of bottle cups, for instance. The perfect position for the top is slightly below that point when big magnet stops repelling the top and starts attracting. Adjust the height of the magnet under the plastic container so the top is located exactly at this position when you try to spin it. You can also move the small magnet alone the top stem to fine-tune the setup. Please note that in this position you might need to push the top down slightly while spinning it. If you find this inconvenient feel free to reduce the distance between the magnets a bit more. In fact one more thing can go wrong with spinning: the speed. If you spin the top too fast it will start precessing even faster and fall too. Spin the top not too fast and not too slow. In fact start from the slow side and keep increasing the speed until you reach the maximum speed after which the top goes crazy. Besides just the initial spinning the spin-stabilized magnetic levitation only works at speeds between 1000 and 3000 RPM (revolutions per minute). So spinning the top faster than 3000RPM won’t help to keep it flying longer. Once you positioned the top properly it should be able to spin stably on sheet. In fact if you are lucky and patient you can position it in a point at which it will self-stabilize itself. Even if you spin it not too well it will will eventually straighten up. Once you lifted the sheet a bit the top jumps and flies away. This means that the top is too light and gravitation force is not enough to compensate the magnetic repulsion force. Add some weight to the top. Brass washers are the heaviest ones, rubber ones are lighter. You can also sand the washers to adjust their weight. You keep lifting the sheet but the top never takes off the sheet. The top is too heavy and magnetic repulsion force is not enough to compensate the gravitation. Remove a washer from the top. If this is the last washer then replace it with the lighter one. If the top won’t take off even without washers at all you will need a stronger set of magnets. 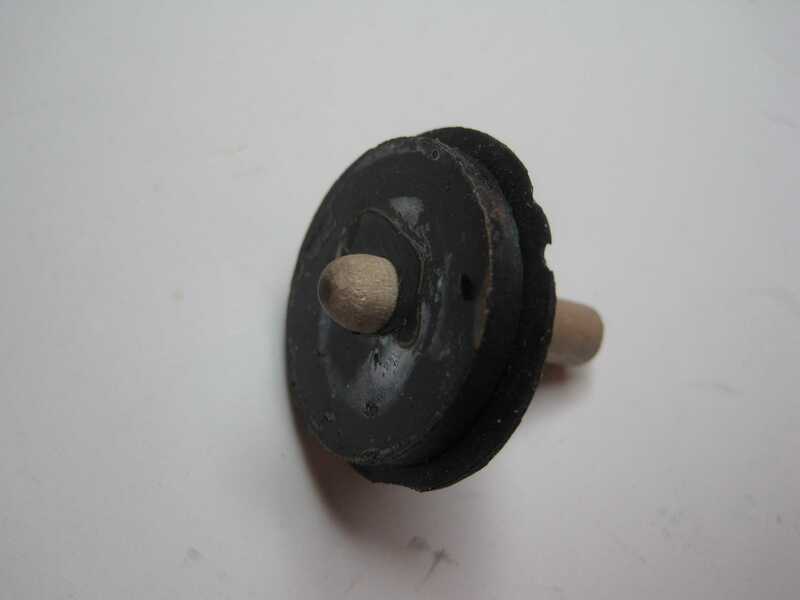 After adding and removing washers to the top you should reach a point when the top takes off the sheet, tries to levitate on top of the magnet but after half a second it flies away. If you notice that it always flies in the same direction, then it’s time for phase 3: leveling. The reason the top is flying away always in the same direction is because the magnetic field of the large magnet is net perfectly level. Pretty much like a ball rolls down the hill our top rolls down the magnetic hill. You even can’t make it horizontal with a regular level as the big magnet could be unevenly magnetized. 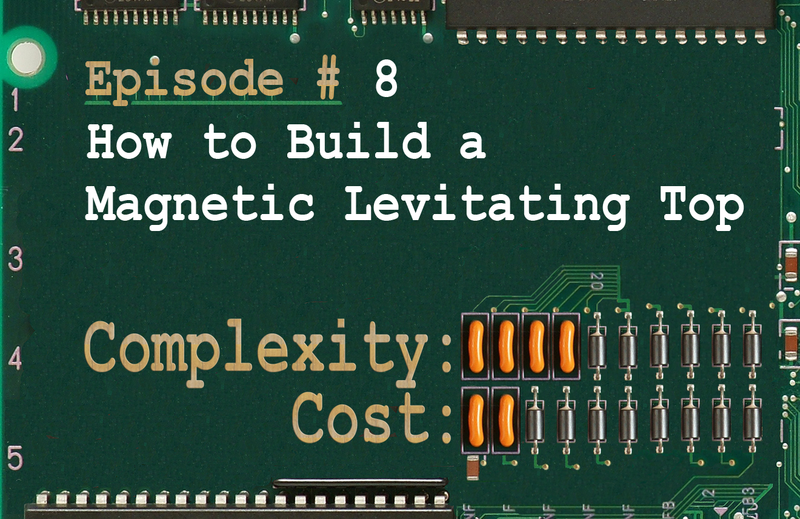 You need to keep adjusting the big magnet level until the top starts flying away in different directions. Also make sure that the big magnet resides on a firm surface like a table. Carpet won’t work as you will need to relevel the magnet too frequently. The truth is you probably will need to do phase 2 and 3 simultaneously as it it sometimes unclear why the top flies away so fast. It could be both the magnetic field level and the weight. Again, you can put washers or something else thick and preferrably non-magnetic underneath the large magnet in order to level it. At this point almost everything is working great except the top is still unable to levitate as it flies away. Time for the phase 4: final fine-tuning. Keep adding the weight of the top. You need to add small weights to the top. The fine adjustment weights are in fact so small that washers do not work anymore. We’re talking about 0.1g (0.004oz) precision. The best candidate for adjusting the weight is electric tape. 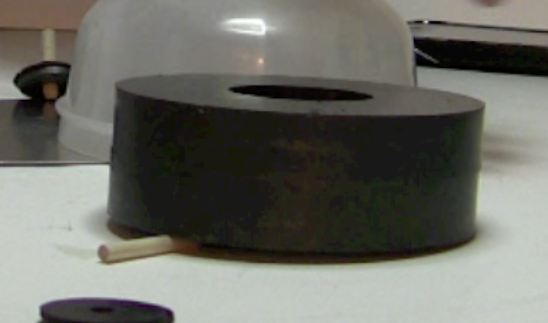 Keep sticking small pieces of electric tape until the top stops flying away. if at some point top levitates for a few seconds than falls down -- take out a strip, cut it in half and stick one half back. 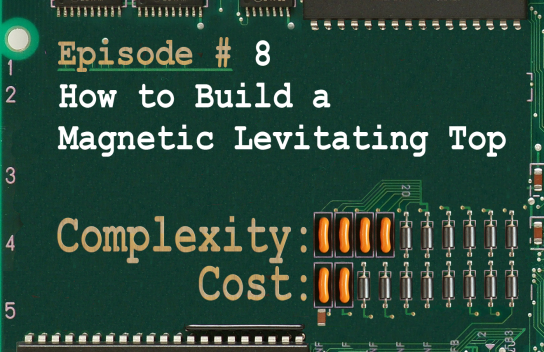 Using electric tape you can build a top that will levitate for a minute or two. One problem with it is bad aerodynamics of tape strips. Once you figured out the final weight it is probably a good idea to replace the take with a bunch of brass washers. This will increase the flight time up to 5 minutes. One more important thing is that the entire top should be very firm. No pieces should be unsecured or wobbly. Use crazy glue if necessary, but make it feel like a one solid piece. The Top. View from the Bottom. You can also see that I tried to reduce the weight of the rubber washer with scissors - bad idea. 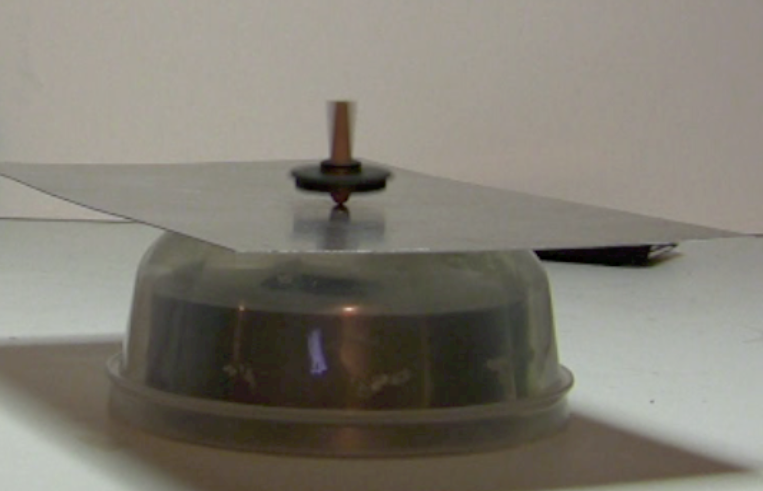 The fact this type of magnetic levitation is so unstable greatly reduces its usability. Basically besides amazing people you can’t do much with it. 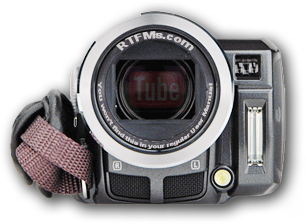 In the future episodes of RTFMs we will build more practical levitation devices. Finally if you’re too lazy to build the top yourself or can’t stop screaming “FAKE”, you can actually buy a retail version of it. It is called “Levitron top” and in some versions even comes with a spinner! But what fun is just buying stuff vs building it yourself? Still, I hope even in this case you will find this video tutorial useful for tuning the retail version. Very cool! I have tried all those old methods before and none worked. nice to know levitation can be achieved without electronics! You just earned yourself a bookmark in my browser! Tweedle, Thanks for good words, I’ll keep doing my best. BTW, I like NuBreaks, is it your website? It looks and works great! SpydaMonky, yeap, this effect is so fragile that it was only discovered in 1970s. 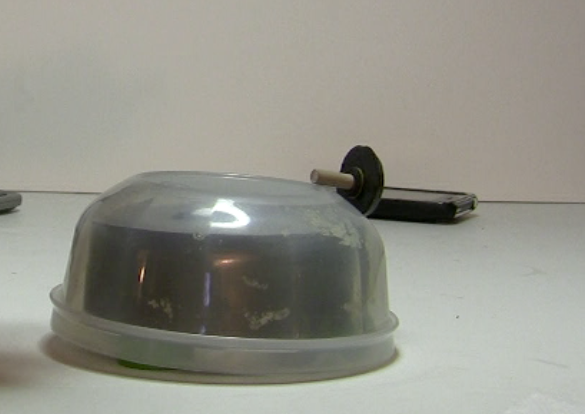 There are actually other methods of non-electronics levitation, I’ll cover them in the future episodes. Thanks for bookmarking!